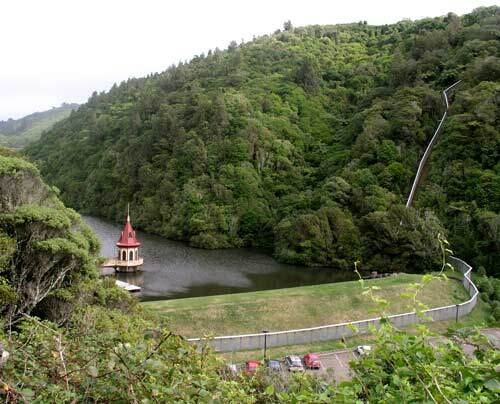 Zealandia (previously Karori Sanctuary) covers the former catchment of the Karori reservoir – opened in 1873 to supply Wellington’s water. When the upper dam closed in 1991, conservationists convinced local authorities to turn the 252-hectare area into a wildlife sanctuary. A trust was formed to manage the sanctuary and a large predator-proof fence was built around the boundary. After pests were eliminated, native birds – including kiwi, bellbird and kākā – were released. Trees such as rātā, rimu and tōtara were planted to restore the forest. These will take up to 500 years to mature. This view looks across the lower dam and water tower.